This is a great book about the 1878 eclipse. This major astronomical event saw the area of totality (total eclipse) move across the American West, placing parts of Texas, Colorado, Wyoming and Montana in total darkness. This was an interesting time of contrasts: the astronomers who wanted to observe the eclipse primarily went to Colorado in part due to its accessibility by railroad. Montana, in contrast, had no astronomical expeditions because not only had the iron rails not reached the territory but the destruction of Custer's command at the Little Big Horn had taken place there in 1876. Ruskin does an excellent job of describing some of the quirks of this event and descrobes many of the personalities involved, including an all-female expedition and inventor Thomas Edison's attempt to use one of his inventions to study the eclipse. 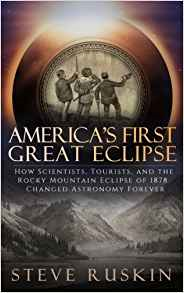 Ruskin discusses the changes then taking place in the field of astronomy and how the Great Eclipse helped to firmly establish America's place in the field. Well-illustrated.